OSWEGO, NY – The Oswego County Tourism Advisory Council (TAC) recognized Lillian Harter with a certificate of appreciation for her many years of outstanding service at its December meeting. 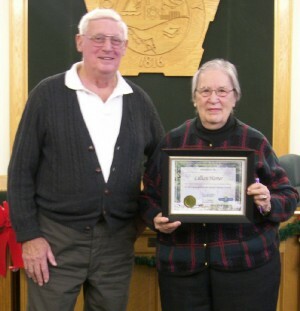 A devoted representative of the Parish area, Harter served as village mayor, participated in the local chamber of commerce and was one of the longest-serving members of TAC. Pictured with Harter is Edwin Lighthall, chairman of the Oswego County Tourism Advisory Council.